Prior to Odin, Wizard have quietly released four solid true metal albums that are a worthy part of any true metal collection: Son Of Darkness (1995), Battle of Metal (1997), Bound By Metal (1999), and Head of The Deceiver (2001). For the band's 2003 release, the services of Piet Sielck as producer have been utilized. Having vastly improved the sound of Gun Barrel earlier this year, I was very anxious to pop this CD into my stereo to see how the collaboration with Mr. Sielck would work out for Wizard. 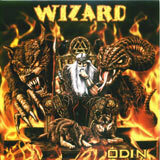 Wizard still serve up true metal in the same speedy and catchy manner that they have done so well in the past. The galloping riffs and a thunderous rhythm section provide an intense wall of sound that does not let up from the first not to the last. The lead vocalist had made significant improvements from the early days of the band: he sounds much more confident these days and sounds much more dynamic as well. He even surprises us with some Halford like wailing during Beginning of The End! As far as musical talent is concerned, Wizard is a very well rounded band. Combine that talent with the ability to write speedy, yet catchy true metal cuts, and the result is a fantastic lesson in true metal. As with the last Gun Barrel release, the contributions of Piet Sielck are certainly an asset to this album. The overall sound is a bit more polished than in the past, especially with the harmony vocals. They come together much better than in the past with a bigger and thicker presence on this album. Fans of true metal who haven't yet discovered this band would do themselves a service by starting with this masterful album and then working back through the band's discography. With their fifth high quality album, Wizard have proven to be a steady force in the genre of true metal. With the last two Hammerfall albums coming as somewhat a disappointment to me, it's nice to see that Wizard can be counted on to deliver an excellent slab of true metal approximately every two years.